The first time the fearsome Kraals attempted to take over the Earth, with the help of their android agents, things didn’t go quite according to plan – thanks to the time-travelling alien Doctor and his allies at UNIT. With the Doctor a prisoner on the Kraals’ radiation-blasted home planet of Oseidon, only his companion Leela can save the day – alongside a most unlikely ally. Tom Baker is the Doctor in The Oseidon Adventure. Sontarans. Silurians. Ice Warriors. Autons. Sensorites. The Sisterhood of Karn. Nimons. Vespiform. The first group are among the most famous alien races across all of pop culture. The second group are very well known to watchers of Doctor Who and recognized across the science fiction fandom. The third group are villains that even long time fans of the show might scratch their heads as they try to remember. With 240 televised stories, Doctor Who has accumulated an impressive Rogues Gallery of villains, aliens, robots, blobs, plants, ghosts, vampire, and other nasties that make viewers dive behind the couch. There have been plenty of repeat offenders; just look at how often the Daleks popped up early in the show’s run, and it didn’t take long for the new show to become oversaturated with the Weeping Angels. But on the other hand, there have been plenty of “one and done” bad guys as well. Some have been memorable, such as the Beast from The Impossible Planet/The Satan Pit and the charming and shrewd Scaroth from City of Death. And some have fallen in the “meh” category – memorable for the serial, but forgotten soon after the credits have rolled. Examples include Richard Lazurus from The Lazurus Experiment and Professor Zaroff from The Underwater Menace. And some…we just don’t like to talk about. Every fan of Doctor Who has their favorite villains. Some people love the Daleks, while some people follow the Cybermen. 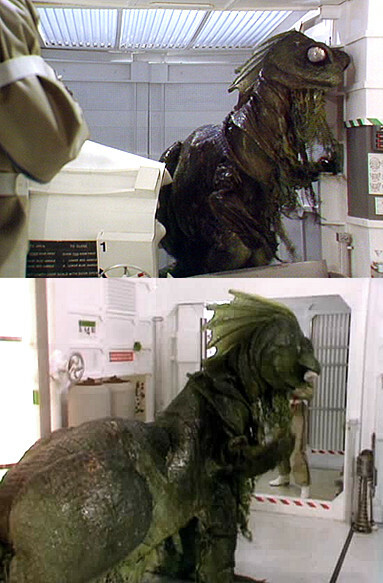 Personally, I’m STILL waiting for a good Silurian story, either on TV or on CD. But everyone also has their favorite/most memorable one-shot villains. Maybe something about the bad guy appealed to them, or their appearance and actions just happened to hit upon their childhood fears. For me, I enjoyed the Sun-Creature from 42, and the fact that we never saw the monster in Midnight freaked me right the HELL out. But to their credit, Big Finish has avoided this type of reliance on obscure history. There have been the standards, of course; the Daleks, Cybermen, and Sontarans have shown up time and time again, and even the Master has shed whatever disguise he was wearing to cackle madly in the Doctor’s face a time or two. The stories Big Finish have released, for the most part, do not rely on the listener being steeped in the history of the runaway Time Lord in order to follow what’s going on. Many of the liner notes for the CD releases discuss how the writer created an initial story that touched upon previous stories or characters from the classic run, only for the producers to go “nah, change that” for the sake of simplicity. The few times a foe or ally from the past has popped up in a story, the exposition has done nothing more than explain just enough for the listener to understand what’s going on before moving on with the story. Which means, when an obscure monster from the past pops back up, it means something. 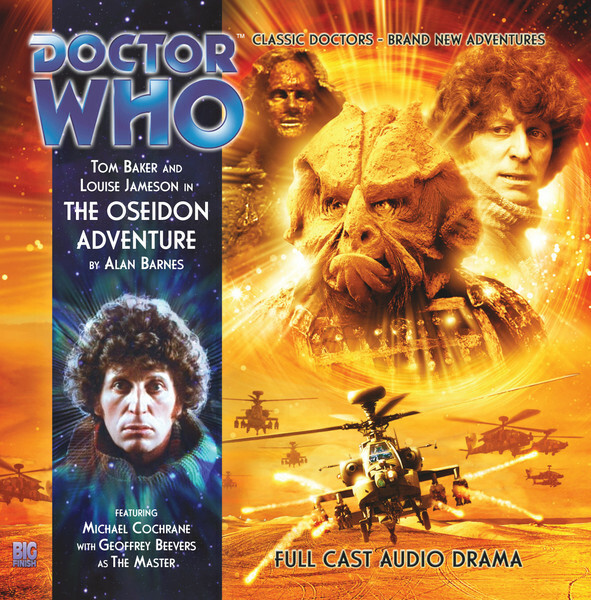 The Oseidon Adventure is the season finale for the first series of the Fourth Doctor Adventures. Following directly from the conclusion of Trail of the White Worm, the Doctor and Leela are helpless as the Master’s plan is revealed. With the help of his alien allies, the Master seeks to take over the Earth. But, as always with the Master, there is much more to his diabolical plan, and only the Doctor can stop him from achieving his goal of ultimate power! It’s a rip-roaring, action packed tale that double backs upon itself once too often, but the final performances from Baker, Jameson, and Beevers more than sell the tale all the way to its conclusion! The alien allies of the Master are none other than the Kraals. Yes, the Kraals, an alien race whose return no one was actually clamoring for after their appearance in The Android Invasion. Now, the story itself is not a bad story. It’s actually very well done and incredibly eerie, as the Doctor and Sarah Jane find themselves on an Earth that isn’t quite Earth, with people who die and then reappear without a scratch and a pub where the patrons stick rock still for minutes on end. The Kraals themselves looked like wrinkled rhinoceras without the horns, and suffered from a full-blown invasion force being played by three actors doing a lot of exposition and arguing. And when broadcast in the middle of a season which included Pyramids of Mars, Planet of Evil, and Terror of the Zygons, what ended up as a solid “B+” story tended to be forgotten or even dismissed when held up to those classics. Alan Barnes takes the central concept of the Kraal, however, and makes it work within the confines of The Oseidon Adventure. A race of scientist warriors who specialize in making robotic duplicates with memories downloaded directly from the original host, Barnes uses it to full effect. To say any more would spoil the story…much like how calling it The Android Invasion kind of gave away the entire central plot point…but much like how the appearance of none other than the Nimons in Seasons of Fear worked out incredibly well, the return of the Kraal is handled in such a way that a listener who be being introduced to them for the first time understands who they are, why they’re a threat, and why it’s important that the Doctor stop them. And it’s also important that the Doctor stop the Master, of course. After being regulated to a minor role in Trail of the White Worm, Geoffrey Beevers knocks it out of the park in this one. The story switches from an investigative mystery to a military style chase, mixed in with the Doctor’s adventure on Oseidon, and Beevers ends up on both side of the wormhole in a way that makes perfect sense for a villian of the Master’s caliber! The dialogue would be hammy in the lines of any other actor…”I shall achieve apotheosis!”…but Beevers adds the weight and sincerity to the part. And his ultimate scheme ties in to this incarnation of the Master, scarred, drained, and willing to do anything to survive. His final fate is also pure Master, as being too clever by half comes back to haunt him! What about Tom Baker? By this point in the season (and future seasons), Baker has shed the “Tom Baker” voice and is purely in his “Fourth Doctor” persona. His reaction to seeing the Kraal again is a weary “oh, no,” and you can imagine a “these guys again” tacked onto the end of it! It’s the Doctor’s turn to have his screen time trimmed, as he spends a good chunk of the early proceedings as Sir Not Appearing In This Story, but when he begins to confront the Master about what’s going on with that wicked intellect and the way the Doctor twists the villain’s words back on him, it’s all forgiven. It’s a strong performance by Baker that bolds very well for the next few series of the Fourth Doctor Adventures. There’s a part in The Oseidon Adventure where the Doctor and Leela ride a horse through a wormhole, laughing and taking a moment to enjoy themselves. It’s amazing just how much fun the duo are having compared to their chemistry during the end of their time together on TV. There’s another great scene where the Master tries to hypnotize her, and Leela’s response is just to smack him across the face. Leela and UNIT, in the back half of the story, team up to take on the Kraal’s and their android invasion force. It’s like someone said “we did Leela and Boudica…who else should we put her with?” Jameson’s performances over the six-story season have been wonderful, and I look forward to her time with Baker in the third season once I make it that far! Back as Colonel “Simpleton” Spindleton, according to the Master, Michael Cochrane turns it up to 11 as he channels Thatcher-era values. He’ll help the Kraal take over the Earth as long as he gets England. Cochrane is great as the “secondary” villain who gets his commupance and a little bit of pity at the end. John Banks and Dan Starkey pull double duty at the UNIT responders AND the Kraal invasion force in what might be an unintentional throwback to the “double casting” low budget days! They do fine, but they don’t really stand out when compared to the Baker/Jameson/Beevers trifecta. The problems with The Oseidon Adventure parallel the weaknesses of the entire first season. A stand alone problem is that the script double backs on itself, with “who’s really who” and double crosses and “I’ll help you” heel/face turns that end up going just a bit too far and leave the listener a bit confused, as the story assumes the listener is all caught up and continues from there. But the main problem is the reliance on nostalgia. All six stories for the Fourth Doctor have all seemed incredibly close in design or story to Tom Baker’s time on television. A story like Energy of the Daleks would have fit perfectly in the late 1970’s, or Destination Nerva as a recycling of the Nerva set for financial reasons, or this tale seeing the Doctor teaming up with UNIT once again. The story, and the entire season, have played it very safe, with the exception of Wrath of the Iceni, which turned out to be the standout audio of the bunch! It’s not a bad thing by any means. Baker’s getting up there in years, and listeners who grew up with him might be a little older and not in the mood for something experimental along the lines of Creatures of Beauty or Scherzo. Big Finish really has spent the season going for the “Saturday tea time in 1977 all over again” vibe, and they’ve channeled that vibe perfectly with Nerva, the Daleks, and now the Kraal. I hope that future seasons, including the upcoming ones with the dearly departed Mary Tamm and the “I’m so pleased she agreed to do them” Lala Ward, as well as another go around with Louise Jameson, push the envelope a little bit and let Baker add just a little more magic to his iconic run. Colin Baker is the Doctor in…The Wormery. This entry was posted in Big Finish Review and tagged 4/5, Big Finish, Doctor Who, Fourth Doctor, Leela, Louise Jameson, TARDIS, the Master, Tom Baker. Bookmark the permalink. The Myrka just wants a hug!